When I became a Realtor, I was given this document. All of our ethics are great to abide by, but one stood out to me. It’s the first one: “I pledge myself to strive to be honorable and to abide by the Golden Rule”. Some Realtors consider this to be a grey area. After all, how you’d like to be treated is subjective, right? I’m not sure I subscribe to that way of thinking. There is something that you, as a buyer, should know about this wonderful world of real estate. All Realtors want to close the deals we’re currently working on so that we can move on to the next one. Understandable. But, at what cost? I’m going to allow you to peek behind the curtain a bit. All listings that are in the MLS have a section called “Confidential Comments”. This section can offer a wide array of information. Sometimes pertinent to the client, and sometimes not at all. Although it says “Confidential Comments”, this doesn’t mean that it’s for the Realtors eyes only. It’s just a discretionary tool. Maybe the home has been tested positive for Chinese Drywall and they disclose it in that section. Obviously the Realtor will tell the buyer, BUT if it’s not in the public description they will get more initial activity. I could go on and on with examples, but I’m just going to focus on one. Sometimes, Realtor Incentives will be offered in the Confidential Comments. Incentives like, “Realtor receives a $5,000 BONUS if buyer pays above list price!” or “Seller pays 5% commission to agent if buyer offers $(amount).” Now, let me first say there is nothing illegal or wrong about offering incentives. However, this is where I think the Golden Rule comes in to play. Now, if I were in my buyers shoes I would want to know that. Technically, it doesn’t have to be disclosed. However, if your Realtor is “negotiating” heavily toward one house over another I would start asking questions. Don’t be afraid to ask, “Are you being offered an incentive for me to go under contact on this home? Are you being offered a higher commission for this property than the others? Am I overpaying for this house because that money is going into your pocket?” I am always upfront with my clients. I’ll say, “Look, you have 3 great properties to choose from. I don’t want to sway you in one direction or another, but I do want you to know that I am being offered ABC incentive on this property here. Let’s list all the pros and cons together, then you can make your own decision.” Don’t you think that’s valuable information? NOW, let’s flip this around. What if the seller is offering a highly discounted commission? I hate to say it, but some Realtors will delete those properties from searches and/or refuse to show the property. Not only is it unethical, but it’s illegal. The next time your Realtor is “negotiating” heavily against one house over another I would again start asking questions! “What’s the commission structure for this property? Do you know something I don’t know?” It’s okay to ask questions. I’m not saying, by any means, that a lot of Realtors do this. I’m just saying that you have a right to know the truth and should empower yourself to ask questions. The last client I had didn’t realize there were Confidential Comments or that there were different commission structures at all! They were very thankful for this knowledge…and for abiding by the Golden Rule! MORAL OF THE STORY: Ask your agent WHAT is in the Confidential Comments and HOW MUCH is the commission! You never know what you might uncover. 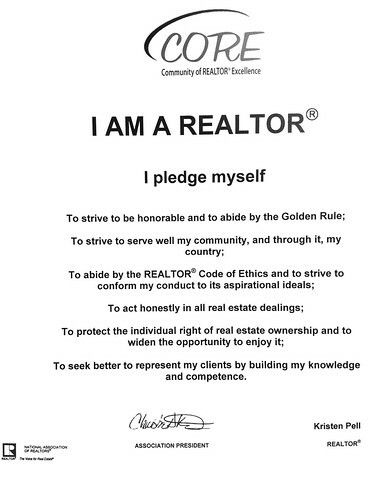 Posted on July 12, 2012, in Real Estate and tagged Buy a Home, Buyer, Commission, Community of REALTOR Excellence, Confidential Comments, CORE, Fort Myers, Golden Rule, Incentive, Kristen Pell, Property Guiding, Real Estate Biz, Realtor, Seller, SWFL Real Estate, Treeline Realty. Bookmark the permalink. 1 Comment.